Asia-Europe dance production 'BOW' has been honored with the Dance on Camera Festival's Jury Prize for "Best Dance Film". Five artists from the UK, Belgium, Faroe Islands/Denmark, China, and Malaysia participated in a cross cultural exchange project motivated by notions of bowing; metaphorically, culturally and physically. The shadows, light and repetition in this short attempt to capture the birthing of movement ideas about folding and origami, rhythmic patterns and ritual during the studio process. Dance on Camera Jury: David Michalek, Laura Taler, and Tanja Meding. 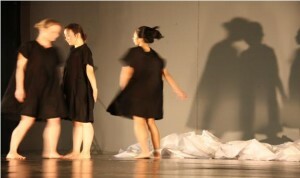 This project was supported by the Asia Europe Foundation as a follow up project of the 5th Asia Europe Dance Forum. Partnership support comes from: Patravadi Theatre, Bangkok, Thailand; Wandering Moon Theater, Chiang Mai, Thailand; MEI-BE WHATever, USA/Malaysia; The University of Winchester; and Stuðulsstovnurin, Faroe Islands. Wang Wei quartet is supported by the French Community of Belgium (Wallonie-Bruxelles International commission); China Dancer's Association; Beijing Dance Academy and XIN-ACT-LAB.